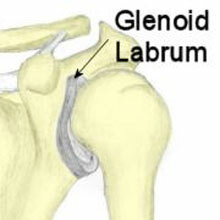 The glenoid labrum is a fibrous ring of tissue which attaches to the rim of the glenoid shallow hole or socket of the shoulder blade where the ball of the humerus or arm bone sits. Symptoms include shoulder pain which cannot be localized to a specific point. Pain is made worse by overhead activities or when the arm is held behind the back. The patient may experience weakness and instability in the shoulder with specific tenderness over the front of the shoulder. Pain may be reproduced on resisted flexion of the biceps or bending the elbow against resistance. The glenoid labrum is a fibrous ring of tissue which attaches to the rim of the glenoid which is the shallow depression of the scapula or shoulder blade where the ball of the humerus sits. The glenoid labrum increases the depth of the shoulder cavity making the shoulder joint more stable. The glenohumeral ligaments which secure the upper arm to the shoulder and shoulder capsule attach to the glenoid labrum. The glenoid labrum is injured by repetitive overhead throwing, lifting or catching heavy objects below shoulder height or falling onto an outstretched arm. Injuries are classed as either superior, towards the top of the glenoid socket, or inferior towards the bottom of the glenoid socket. A superior injury is known as a SLAP lesion (superior labrum, anterior to posterior and is a tear of the rim above the middle of the socket that may also involve the biceps tendon. A tear of the rim below the middle of the glenoid socket is called a Bankart lesion and also involves the inferior glenohumeral ligament. Tears of the glenoid labrum may often occur with other shoulder injuries, such as a dislocated shoulder. Rest and apply cold therapy to reduce pain and inflammation. A doctor may prescribe NSAID’s (nonsteroidal anti-inflammatory drugs such as ibuprofen) – don’t take if you have asthma. A full and gradual rehabilitation program to restore full function is required. Unstable injuries will require surgery to re-attach the labrum to the glenoid. Bankart lesions will require surgery. Any underlying causes which contributed to the injury such as shoulder instability should be addressed. Following surgery, the shoulder will usually be kept in a sling for 3 or 4 weeks. After 6 weeks more sports specific training can be done although full fitness may take 3 or 4 months.